In this romantically titled piece the artist depicts what appears like a single industrial complex. The viewers finally get to witness an active plant — as opposed to the abandoned warehouses and buildings that populate many other Detroit locations Stephen Magsig chooses to portray. Darkness blurs the edges of this massive heap of metal and concrete, lending it a somewhat abstract profile, and a powerful atmospheric impetus. Early dawn gradually mixes in. Strategically dispersed points of light, shimmering and glowing, assure that this almost completely monochromatic vision has, in fact, a life on the inside. The artist places the bulk of the plant slightly to the right of the center: the composition unfolds from left to right, literally peaking at the highest point of the structure, the crimson dot of the tallest chimney. Both the slight angle of the subject and the water expanse before it mitigate the “frontal attack” method the artist usually employs in his industrial Detroit pieces. Rhythm plays an important part in the organization of the composition. Though not immediately apparent, it nevertheless determines the progression of the smaller buildings, from left to right, almost like in an ascending stairway. The three chimneys, breaking the monotony of this established rhythm, themselves generate a visual “beat.” Anyone who lived in a large urban center and witnessed a mass scale construction, will recognize in this murky scene a certain aesthetic logic, and even beauty. The river at the foreground adds the image a touch of tranquility, but also of suspense. As the surface reflects and smudges the lights, the water becomes a sort of a “buffer zone” between the viewer and the factory, a calm transitional phase that at once communicates and warns about the other side. The reflections almost inevitably bring to mind Claude Monet’s landmark “Impression: Sunrise;” indeed, the loose treatment of light and contours suggests impressionistic sensibility that’s rarely seen in the artist’s daytime paintings. Nocturne is a relatively narrow musical genre with the clear objective to reflect or engender in listeners the sense of night: it’s usually mellow, soothing, and evocative. Despite its generic limitations, a nocturne can be a gripping, and quite charming piece of music. 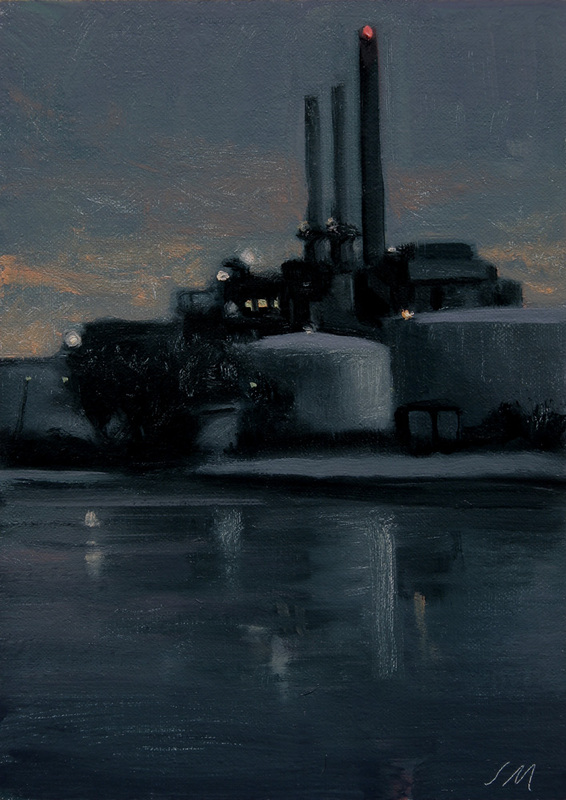 Stephen Magsig’s use of the term asserts the programmatic nature of this work (several other Nocturnes exist) and, eventually, confirms its very own, remotely humming, night-time charm. Thanks for introducing us to Stephen’s and Tracy’s work recently. They are Very enjoyable and readable critiques. I whole heartedly endorse your reviews of historic artworks. They provide interesting and unique reads. Thanks, Casey, for both angles:). I was hoping to bring the two together, because there is nothing like discussing working artists and seasoning it with the classics. I also think that writing about historic artworks gives me perspective and may help to improve my critical ability.